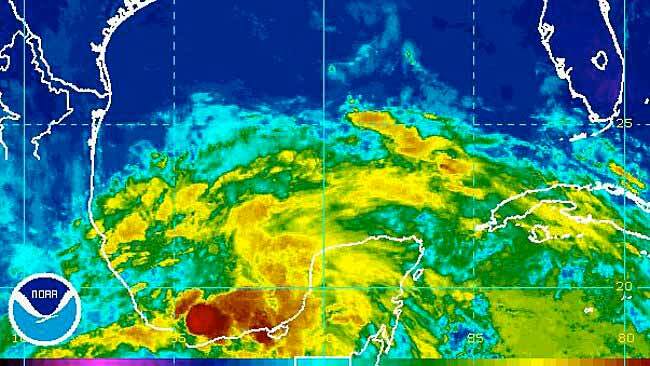 Belize NMS: Conditions will become more moist and unstable tomorrow night. 24-hour forecast: Sunny with cloudy spells today and cloudy at times tonight. Showers or thunderstorms will be isolated today, with a few more over the south tonight. Winds: East 10-20 knots with occasional higher gusts. Today: Winds: East 10-20 kts with higher gusts. Seas: Moderate - rough. Waves: 4-7 ft. Isolated showers or thunderstorms. Tomorrow: Winds: E-SE 10-20 kts. Seas: Moderate. Waves: 4-5 ft. Isolated showers or thunderstorms. Marine Outlook: (Sat night) Similar winds and seas as tomorrow but with some showers and thunderstorms developing. General Outlook: (Sat & Sat night) Cloudy with a few showers or thunderstorms mainly inland on Saturday, then over most areas Saturday night. An area of disturbed weather over the southwestern Gulf of Mexico is being monitored closely for tropical development over the next few days. Miller is referring to disruptive winds at middle and upper levels of the atmosphere known as wind shear. These westerly winds often cause a developing or established tropical system to lean to the right and can cause dry air to invade the storm’s circulation. “Because of the wind shear, we may see a low-level circulation move westward toward the coast of Mexico and the upper part of the system driven off to the east over time,” Miller said. It is possible that some of that moisture in the form of drenching showers and thunderstorms could be steered over part of Florida and the Bahamas next week. “Should the system develop a low-level circulation we will be likely be only dealing with a minimal tropical system, such as tropical depression or tropical storm,” Miller said. Even a very weak tropical system can bring torrential rainfall, gusty thunderstorms and rough seas with little notice. As a result, interests around the shoreline of the southwestern Gulf of Mexico should continue to monitor the situation. Regardless as to whether or not a system develops, unsettled conditions will continue over southern Mexico and part of Central America into next week. 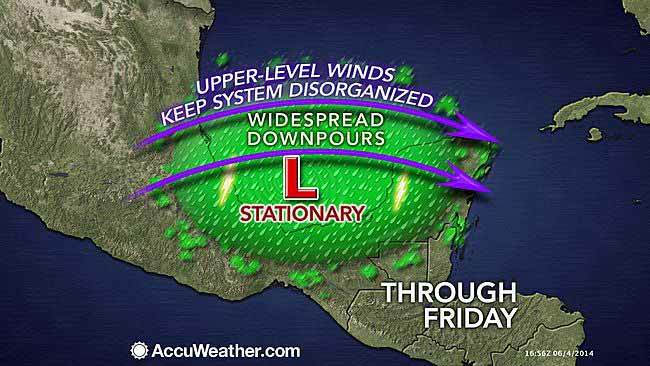 A plume of tropical moisture will continue to hover over southern Mexico and part of Central America for many days. Daily rainfall rates of 3 to 5 inches are likely in the area from southeastern Mexico to Guatemala and Belize through the weekend. The rainfall will act as a double-edged sword. “While the rain can lead to long-term and short-term drought relief, it can also lead to incidents of life-threatening flash flooding and mudslides in the region,” Miller said. 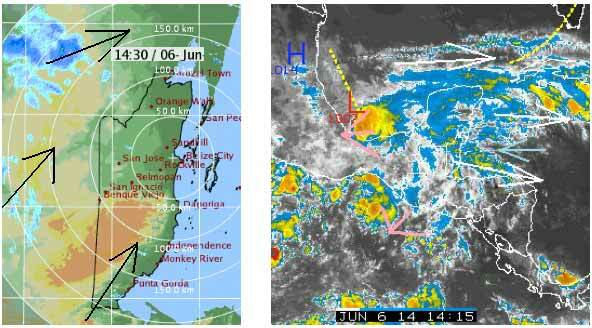 The area from the Pacific side of southern Mexico and Central America to the western Caribbean will be areas to watch this weekend and next week respectively as the broad area of disturbed weather and plume of tropical moisture continues to thrive in the region. 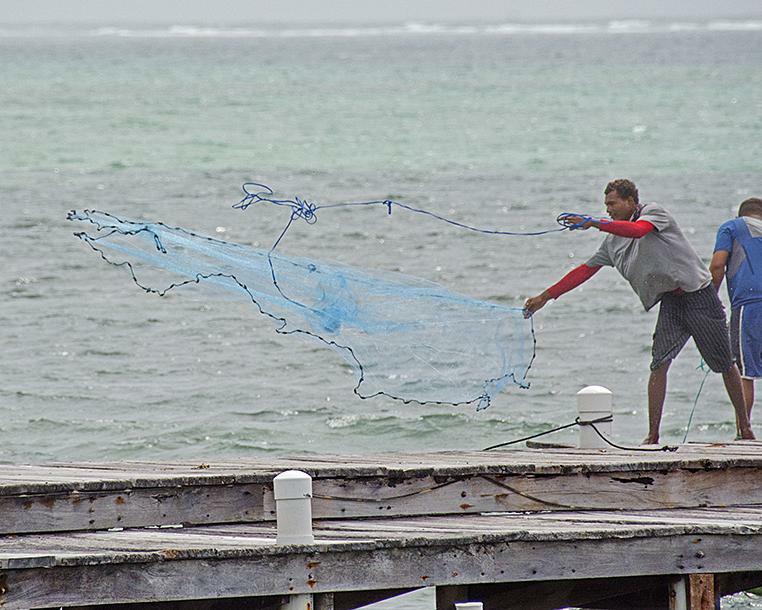 On Ambergris Caye the wind has slowed to 7 mph from the East and our expected high is 87. Still no rain but with a calmer sea the boats are going out fishing and diving. Gona need bait. There is rain around, but not much, some down in Toledo, but that dying out presently. .. . .I am expecting only small isolated patches of rain today. Mainly cloudy, some sun coming through occasionally. . . . .Presently, I have been recording high Night time temperatures, up in the 78 - 80°F ( 26°C ). ..As we get into the Rainy season, the Night time temperatures will become more stable, around 76°F ( 25°C ) . . . .The Day time temperatures, even despite the cloud, have been getting up to around 86 - 92°F ( 30 - 34°C ). . ..The Day-time maximum temperatures will probably, be getting a little lower, since the Sun has now passed being overhead at mid-day, until it returns in mid August.